Graduation season is among us. Well, almost. If you’re the one doing the graduating, chances are you’ve been dreaming of the moment where you can finally put away those books and relax (at least before the next adventure). Who knows how many endless hours you’ve spent reading and re-reading those history books? Or maybe those precious hours were spent memorizing chemical reactions. Perhaps you wish you’d spent a teeny bit more in the library and teeny bit less by the pool. Either way, you’ve worked just about as hard as you could and your well-spent hard work is about to come to an end. Whatever you’ve been studying all these years is about to pay off with the most epic graduation celebration (and hopefully a job). 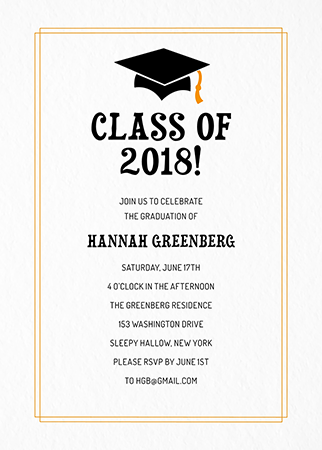 First things first, you’ll need to send out those graduation party invitations. As you begin getting ready for the big ceremony, your thoughts may have wandered over to your graduation party. What will you do to celebrate this momentous occasion?! What kind of cake will you get? Will there be cup cake toppers in the shape of tiny graduation caps? Will you opt in for a photo booth equipped with your class superlatives? There’s so many fun details to think about! 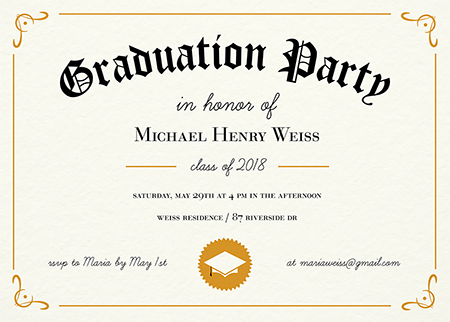 So while you finish up your last semester studying away, we’ve gathered some stellar graduation party invitations for you to day dream on. But maybe focus on studying for those finals first? 1. 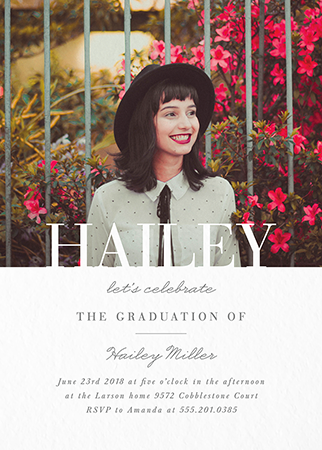 This modern photo graduation invite will work for just about anyone. Pick one of your favorite graduation photos and customize the invite with your personal details. 2. 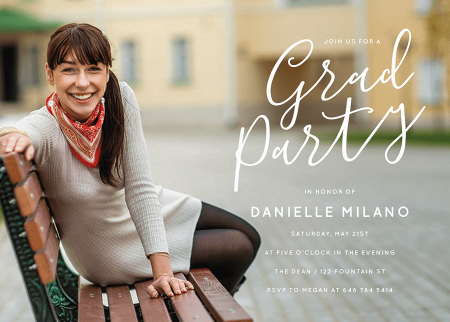 Don’t feel like using your graduation photos on your party invites? That’s cool, there’s a bunch of great invites using fun illustrations like this one. 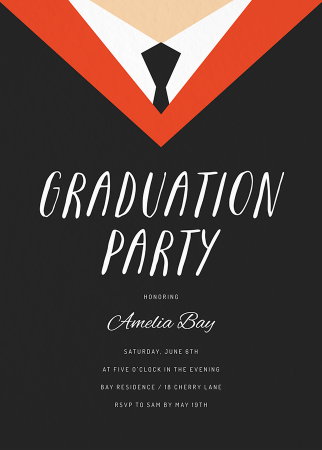 These graduation party invitations have a fun font to spell out the details of your big party. Simple with a flare. 3. Ahh, the diploma. You’ll be getting the real thing soon enough. But in the meantime, you can customize this template with your party details and pretend it’s the real thing. 4. We’re suckers for simple photo graduation party invitations. Like this one. Use a photo with a focus on the left side and customize the details on the right. The scripted font adds a little pizazz to this invite and the simplicity makes it super versatile. 5. 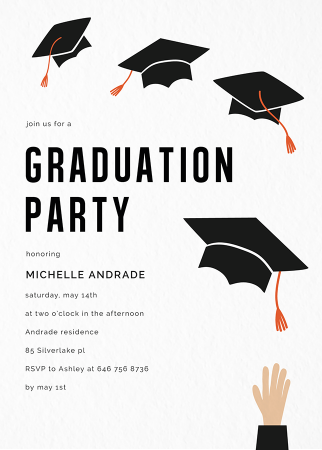 If you’re looking for something a little more playful, check out this illustrated graduation invite! 6. Another delightful illustrated graduation invitation. The grad hats add a fun accent to the design and the simple bold font lets you customize the details. Planning a graduation party can be a ton of fun! There’s also quite a few decisions to be made and ideas to be pondered. Are you going to stick to your school’s colors or will you march out on your own and pick whatever colors tickle your fancy? Remember to plan ahead, but don’t get too carried away before you’ve finished your studies. Enlist the help of family that aren’t knee deep in studies to help make some decisions and start planning the big event. That way when you’re freed up from your exams you can take the wheel and finish up the big plans. You won’t end up waiting until last minute, but you’ll still have input for your own party. Your brain is probably a giant pile of mush at this point — filled with formulas and thesis statements. So when you’re ready for a break to think of some fun ideas for your celebration, we got you covered. 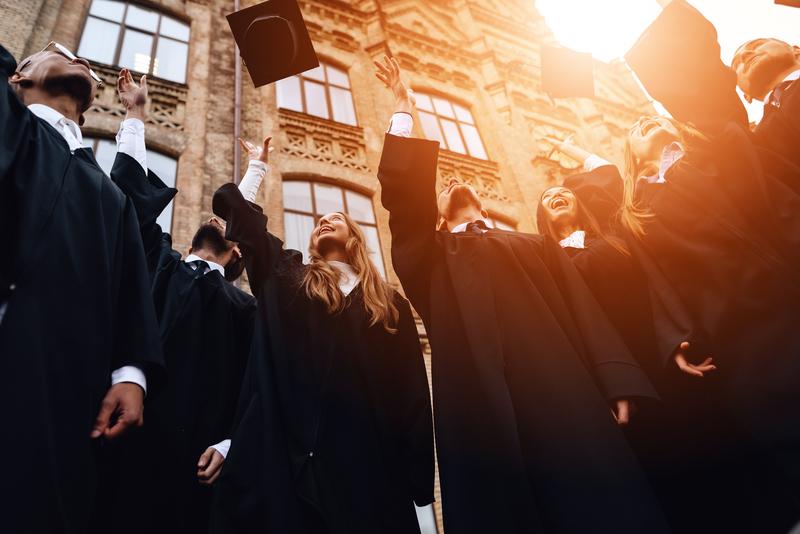 Here are 10 articles that showcase some great ideas and tips to help you make the most out of your graduation party planning. Have you ever wondered what a pretzel in the shape of a graduation cap might look like? Checkout this article to see for yourself and perhaps you’ll even give it a go for yourself. Not a fan of pretzels? This post has some other great graduation party ideas that are pretty simple to do yourself. From graduation cap cup cake holders to a great popcorn bar set up, this article has got some pretty neat ideas for your graduation party. Our favorite? The play on words — cookie favors (‘You’re one smart cookie’). Some of these ideas, like the veggie bar, can even be used for parties you’ll host later in your life now that you’re going to be a fully grown adult. Adults like veggie bars, right? Superlative photo booth? Yes please. Photo booths don’t have to be hard to set up or even cost a whole lot of money. This post has some fun ideas for photo booths along with other great tips like creating a unique hashtag. If you’re looking for some crazy-easy tips on ways to incorporate the grad theme without too much effort, this post has you covered. You’re about to graduate, chances are your bank account is not going to get bigger any time soon. DIY-ing your graduation party is a great idea (if you’re into that sort of thing). This post has some fun DIY ideas, but if you’ve never crafted before in your life maybe think twice before trying to go all out. Sticking to one project while asking the family to help with funding the rest may be a good idea. The title isn’t lying, these ideas are super chic. If you’re looking for some ideas to really project your personal style this post will get your wheels turning. This post is filled with fun decoration and theme ideas for your graduation party. They’ve even included some free printables you can use! So many fun graduation ideas! Which one(s) will you incorporate? Let us know in the comments! And of course, congrats on such an epic accomplishment & welcome to the real world.